Print guidelines are designed to help ensure that print and e-documents can be accessed by a wide audience. These guidelines can be applied to any documents making them easier to read and facilitating conversion to other formats such as large print, braille or DAISY. Example printed material project evaluation report key messages. Ensuring you have digital documents that are accessible means you can provide these quickly on request in the font size suitable for the visitor. Remember one size does not fit all with sight loss and one person may find one font size much easier to read than another. If you know your reader, ask what they need! Bear in mind that someone might read your document using specialist equipment, including magnifiers, video magnifiers or scanning devices. The layout and structure of your document will a have big impact on their device’s effectiveness. Well formatted text documents are easier to transcribe into accessible formats, including braille, audio or large print. You should produce all documents in at least clear print (font size 14 point). Large print is anything larger than 16 point, but is often produced in 18 point. If somebody wants a document in a larger font size, never just enlarge your original using a photocopier. Always prepare a new document to suit their needs. Use a plain sans serif font style, such as Ariel or Helvetica. Don’t use block capitals, italics, underlining or break words up over different lines using hyphens, as these can interrupt someone’s reading flow. Use bold text sparingly for emphasis. Print onto a good quality matte finish paper to avoid glare. If you want to print double sided, use thicker paper to prevent text bleeding through to the other side. If you’re printing a bound leaflet or booklet, don’t print too close to the centre fold or you’ll make it difficult for someone to use a magnifier. Create contrast between the text and paper using black on white, black on yellow or white on black. Align all text to the left-hand margin, and avoid the use of columns where possible. If you must use columns, ensure adequate spacing between each column and emphasise the column by using a dividing line. Give your document a title and headings using your word processor’s built-in heading level tools. This will make it much easier for someone using a screen reader or magnification software to read it on their computer or tablet. Use dotted lines to enable the reader to track across open space. When creating reply slips, consider that someone with sight loss might have bigger handwriting and need more space to complete it. Print page numbers, footnotes and superscripts in the same print size. OUMC Welcome Pack and penfriend. the individual site. They also include tactile information, braille and audio pens. 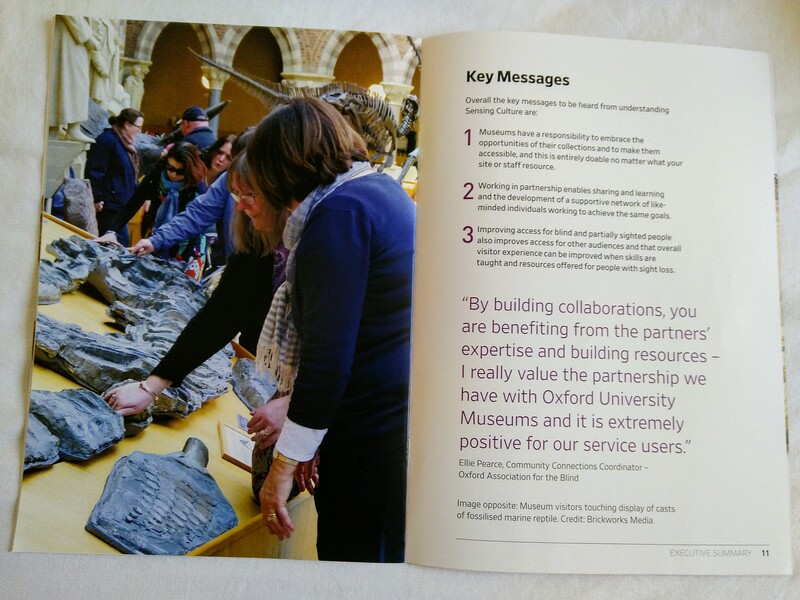 Included in the pack are descriptions of key views and aspects of the building that will assist visitors. The packs were tested at events and open days as part of a trial and are now an integral part of welcoming visitors. What materials do you currently have in print that could be improved using the above tips? What future materials do you have planned for print that could also benefit from this advice? Could you embed the above tips into your own set of guidelines for all printed documents? If you would like more detailed information about how to create accessible documents, visit the UK Association for Accessible Formats’ website (www.ukaaf.org).